Day 11, May 9, 2018. 4.4 miles, Pheriche to Lobuche, elevation 16,110. We awake to gorgeous snow covered ground outside our window — nice that it came in the night and not on us, though I’d gladly take walking in snow over walking in rain any day. When I get upstairs for breakfast I find out that lighting took out the internet tower in the middle of the night. Ha! I stayed up late last night, tucked into my sleeping bag, writing on my phone in an attempt to catch up on the blog and now I won’t be able to post. So goes it - nature rules the roost in these parts and anyway I’m used to being disconnected when I go backpacking — it’s the staying in beds and taking meals and tea breaks inside instead that have started to spoil my expectations! After another breakfast of Tibetan Bread with honey and a side of hard boiled eggs, (my current fave), we head outside onto the snow covered path and make our way through the wide valley ahead. 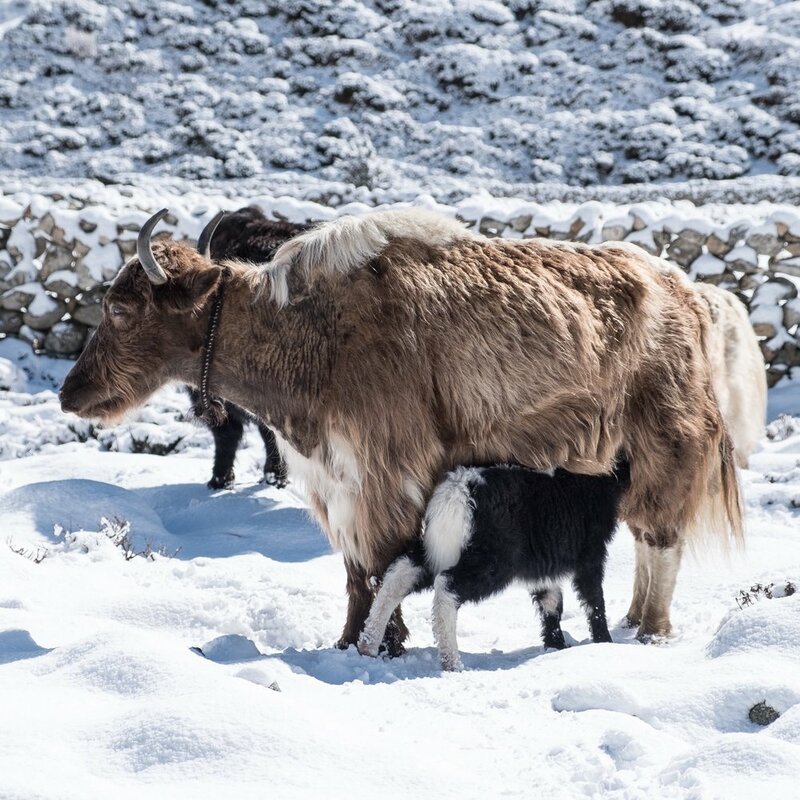 Just beyond the edge of town, amongst the snow-covered rock walls, naks (female yaks) are grazing with their babies and it is just about the most precious thing any of us have ever seen! William and our guides have to all but tear us away from photographing these cutie-pie creatures. As we walk, we are all feeling more winded and some of our group begins to fall behind. The air is ever getting thinner and it seems like the elevation is starting to hit Heather the worst. Her steps have slowed, but Alex (like the southern gentleman that he is) has shouldered her pack on top of his own. After carefully crossing another Gatorade glacier ice colored stream, (this one without a bridge), we stop for lunch at what feels like a high-altitude Nepali version of an European Plaza. Tables for the few surrounding restaurants are all grouped together outside in one central location and we sit amongst other teams of trekkers and eavesdrop with excitement to those who are on their way back from EBC. The sun is bright and high and the snow that we were so enamored with just a few hours ago, has almost completely melted already. Alok and Alex hopping across the icy waters. Shortly after lunch, we come up over a rise and the path takes us straight through the middle of a memorial site. 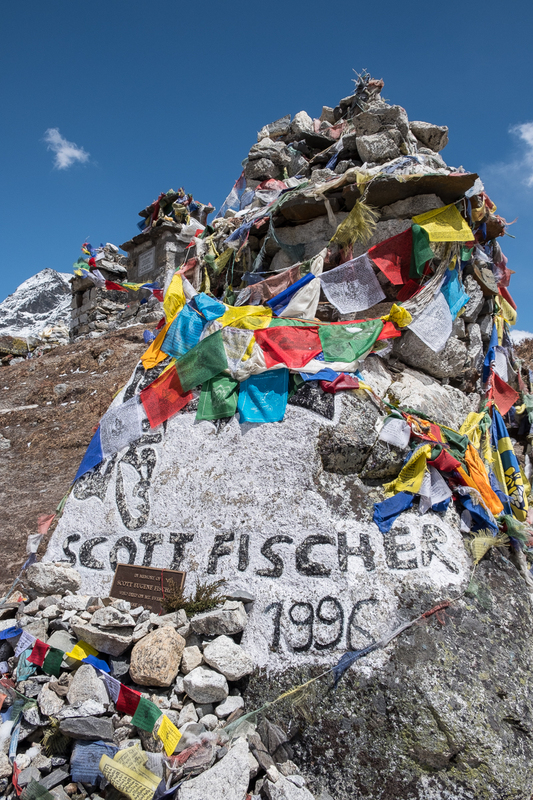 Tombstones of fallen climbers wrapped in prayer flags surround us, some names recognizable from the infamous 1996 disaster that was the focus of Jon Krakauer’s, “Into Thin Air,” others from more recent summit attempts and many more whose name plates have faded or fallen off long ago. 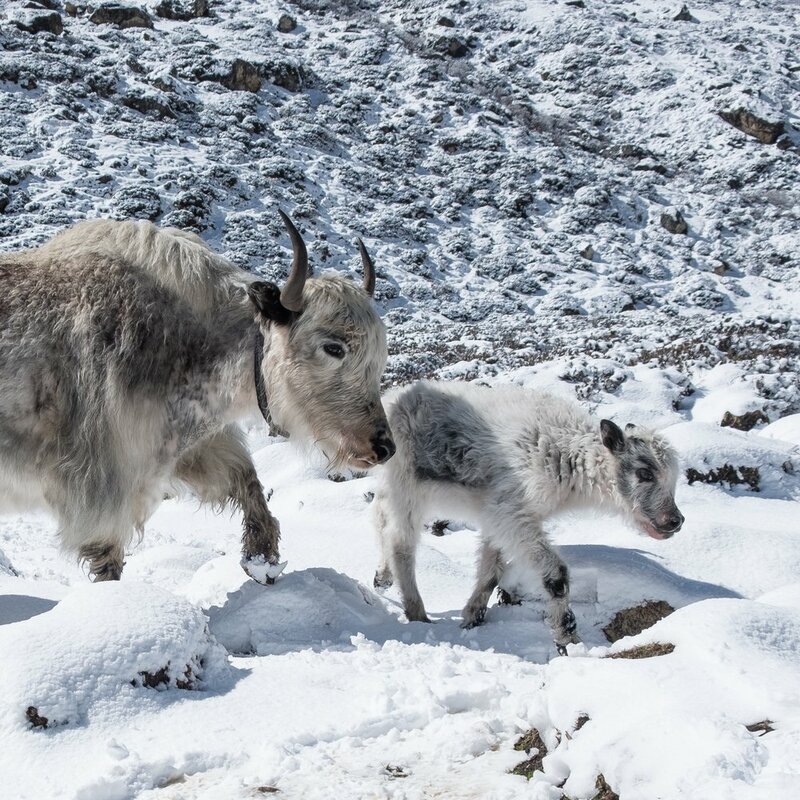 It is another reminder, like the talk yesterday at the Rescue Association, that this trek is not just a pretty walk in the park with baby yaks and beautiful mountains, but something much more sacred. Our afternoon walk is short into Lobuche, and though it doesn’t feel like it to me, we’ve gained nearly 2200 feet since leaving Pheriche. 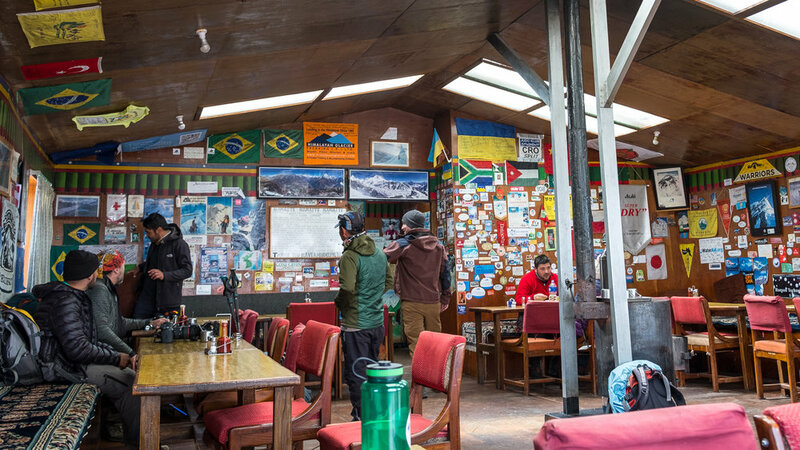 We arrive at our teahouse destination mid-afternoon and find the common room fairly empty of other trekkers, but completely covered in posters, world flags and Mt. Everest memorabilia. With a few hours to go before the sun sets and we can eat again, some of us hang in the common room, drinking tea and sharing stories, while others retire to their rooms to take naps. Even inside the teahouse, it is noticeably colder above 16,000 feet and I lounge on the benches, wrapped snug in my sleeping quilt, not quite able to focus on any particular task, (like catching up on the blog or organizing my snacks for tomorrow), but just enjoying being in the presence of others. I’ve got way too much fomo to give in to a nap, even though I know I could really use one. Eventually, afternoon turns to evening and it’s dinner-time once again, wahoo! Most of our group is feeling lethargic, but it’s still fun to gather while we eat. Soup is tonight’s most popular dish — anything to help keep us warm! The proprietors have lit the stove, but the smell of this one is starting to bother me. It’s primarily kerosene heat now as we are high above tree line and without wood for fuel, but unfortunately the ventilation here is lacking. Despite feeling like I’m breathing in car exhaust, I slide closer to the stove after dinner as I just can’t seem to get warm. Sari and I watch as Danny and Alex bond over music videos on their phones. She is thrilled that through this power of happenstance, two strangers traveling along from completely different places have found some commonality, and her observations make me smile. Like seriously, it’s not every day that a guy from the Bronx and another from Birmingham end up chatting together on their way to Mt. Everest! At some point, I can’t keep my eyes open anymore and knowing what a big day we have tomorrow, I head down the hall to our room to catch some zzz’s. It’s super cold back here and I put on a few more layers before tucking in for the night.